YellowAirplane.com: The F-16 Falcon Military Supersonic Jet Fighter Books, F16 Falcon. The F-16 Falcon Military Supersonic Jet Fighter Books, F16 Falcon. Los F-16 Falcon militares Libros supersnicos aviones de combate, F-16 Falcon. Les F-16 Falcon militaires supersoniques Livres avion de chasse, F 16 Falcon. Die F-16 Falcon Military Supersonic Jet Fighter Bcher, F 16 Falcon. 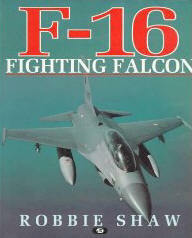 F-16 Falcon Military Books Section. In the Military Fighter Jets Department. 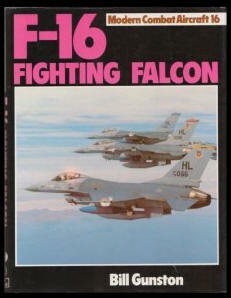 F-16 Fighting Falcon Books telling every specification of the F16 Falcon US Air Force Fighter Jets. 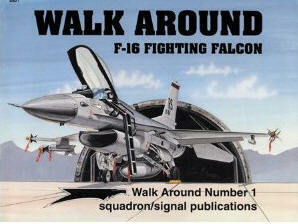 F 16 Fighter Jet Military action books, US Jet Fighter History and Beautiful Pictures, all Photos in these Books. Check out the F 16 Fighter Jet History, from Diagrams to pictures to sea stories of the military combat action, airplane books. The F-16 Fighting Falcon Military Fighter Jets, Books with Beautiful Pictures, Photos and Drawings. BooksThe F-16A used a Pratt & Whitney F100 turbo jet engine producing 14,870 lbs of thrust when in afterburner produced 23,830 lbs of thrust. The F-16 's max speed is 1350 mph with a cruise speed of 577 mph. The "A" model has an empty weight of 14, 567 lbs and a max weight of 33,000 lbs. In contrast, a later version, the F-16N produced a total thrust with afterburner of 27,000 lbs. 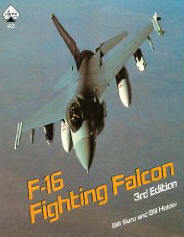 These F16 Fighter jets books are by amazonebooks and Historic Aviation books. Here's a kids training hint. Put an airplane book on the coffee table, place an airplane magazine in the bathroom, put a poster of a jet fighter on their bedroom wall, watch a F-16 Falcon movie then go to an air show where the USAF Thunderbirds are flying demonstration flight. Will your kid learn a lot, you bet he will. 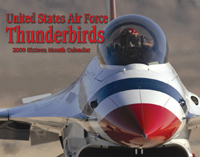 Click Here for a list of air shows. F-16 Falcon Fighter Jets Books. Dru Blair. You're in the cockpit of an F-16 during a low-level attack in the Black Forest of Germany. In your Heads Up Display, you see the tank that is about to become another kill. 19"x 27" print is signed by the artist. Drendel. The F-16 Fighting Falcon is the most widely used modern fighter in the world, with 21 nations - including Belgium, Denmark, Turkey, Egypt and Israel - flying it. This book presents a full-color review of the varied national insignia, squadron markings and camouflage worn by F-16s, including USAF operational markings and nose art. 64 pages, 200+ color photographs, 8"x 11", softcover. Fighting Falcon A and B Versions. Lert. At a time when other fighters are being retired to museums, General Dynamics' F-16 Fighting Falcon fighter-bomber is still a formidable foe in international competitions against fifth-generation planes. This lavishly illustrated volume examines the development and service of the F-16A and B Fighting Falcon, from the prototype's first flight in 1974 to today. 80 pages, 150 color and B&W photographs and 56 color profiles, 8"x 9", softcover. Aloni. This heavily illustrated book examines the complete history of the Israeli Air Force's First Fighter Squadron and the cutting-edge aircraft it has flown in thousands of missions, from 1948 and the Avia S-199 through the Spitfire, Mustang, Mystre, Mirage, Nesher, Kfir and the current F-16B Barak. Includes an appendix of squadron kills and losses. 224 pages, 640 photographs and four pages of color profiles, 8"x 11", softcover. 56th Fighter Wing - To Fly and Fight the F-16. Renner. Featuring the stunning air-to-air photography of John Dibbs along with fascinating narrative written by a U.S. Air Force pilot, this lavishly illustrated book describes what it's like to fly an F-16 Fighting Falcon - known to its pilots as the "Viper" - in combat as it details the missions and operations of the F-16-equipped 56th Fighter Wing. 192 pages, 300+ color photographs, 11"x 9", hardcover. Larsen & Nigro. Follow the history of Selfridge Field, proving ground for so many young aviators who ultimately became general officers - including Jimmy Doolittle, Curtis LeMay, Carl Spaatz, and more than 100 others - that it became known as "Home of the Generals." Covers everything from crude biplanes to F-16 fighters and includes some of the best images of 1920s and 1930s squadrons we've ever seen. 128 pages, 175 B&W photographs, 6"x 9", softcover. F-16 Fighting Falcon Units of Operation Iraqi Freedom. Davies & Dildy. The F-16, the most prolific fighter in U.S. and coalition Middle East operations for over a decade, has been the workhorse of the region. Here, you'll see F-16s in Operation Iraqi Freedom, including the F-16CJ "Wild Weasel's" destruction of the Iraqi air defense system and the F-16CG "Night Falcon's" numerous all-weather strikes. 96 pages, 70 color and 15 B&W photographs, 24 color profiles, 7"x 9", softcover. Darling. Known as the Viper to its aircrews, the F-16 has served the USAF as a multi-role fighter for twenty-five years. This book includes chronology, prototypes, operational history, variants, specifications, weapons, production figures, model kit information and more. Color illustrations show the different markings used in various theaters of operation. 96 pgs., 16 pages of color photos, 3-views and more. 7"x 9", sfbd. Diary of a Cold War Fighter Pilot. Rosenkranz, forward by Cheney. These stories will put you in the cockpit. A superb account of the performance of the F-16, and of the grueling and demanding training missions that convert young civilians into the worlds finest pilots. 325 pgs., 25 illustrations, 6"x 9", softcover. This is definitely the easiest reading on how to fly and fight a modern fighter/attack aircraft. In the first 20 pages I learned more about air to air guns than I ever learned and I've read many manuals. I only fly computer simulators, but, like any hobby you want to be good at it. I've posted message's on some of the other sim sites about this book because I think it is a must for sim enthusiasts. I also can now appreciate what these pilots must go thru to learn their craft. This book is essentially a collection of photographs of the F-16 from the Thunderbird demonstration team, to the European scheme, to the Air Superiority scheme, to the US Navy Aggressor scheme. The photographs are accompanied by text which explains unique features of the photo. A useful reference for scale modelers who want to customize stock plastic kits. Plenty of shots of landing gear, IR sensors, cockpit (as much as can be shown for an unclassified document) and engine. If you're looking for information on how the bird actually works, you're better off with a copy of the "Falcon 4.0" PC flight simulation game manual or Shaw's "Fighter Combat: Tactics and Maneuvering" book. Tradition plays a large part in modern nose art. Names such as Memphis Bellle, Chow Hound and Maid in the USA that once went to war on B-17s and B-24s are now carried by B-52s and FB-111s. This heavily illustrated book examines a wide variety of that modern nose art and unusual markings - including many designs that have since been removed - on B-1Bs, B-52s, F-111s, C-135s, KC-10s, fighters, and others. 128 pages, 250+ color photographs, 9"x 11", softcover. sfbd. The evolution of the F-16, the best lightweight, multi-role combat aircraft in existence, with200 color photos. The "Fighting Falcon" is renowned as the best dogfighter in use with air forces around the world, and one of the stars of the Gulf War. This volume follows the F-16 Falcon's evolution from the lightweight day fighter to becoming one of the most potent warplanes ever developed and now in active service with a score of the world's air arms. It features first-hand accounts of action in the Gulf War and a pilot's eye-view of the early General Dynamics test programme. These stories will put you in the cockpit. A superb account of the performance of the F-16, and of the grueling and demanding training missions that convert young civilians into the worlds finest pilots. 325 pgs., 25 illustrations, 6"x 9", sfbd. Designed to be a lightweight single-seat fighter with excellent dogfighting capability, the F-16 Falcon has evolved into a successful multi-role aircraft of which over 4,000 have been produced to serve more than two-dozen countries. This book follows its history from early-1970s development through its evolution into multiple variants with a wide range of avionics and weapons. 50 pages, B&W photographs, detail drawings, color profiles and more. 11"x 8", softcover. Follow the evolution of the F-16 Fighting Falcon through the prototype, completed model and added weaponry. Every year, 1,000 potential pilots undergo intensive, six-month, 58-flight, 2 million-a-head fighter pilot basic training, where they are pushed to extreme limits. Blending intense human drama with a wealth of information about the world's most expensive, deadly, high-tech air force, this book follows a batch of new recruits at Luke Air Force Base, the world's largest fighter wing and the U.S.' single most important source of fighter pilots. 224 pages, 6"x 9", hardcover. Tremendous full-color portraits of the F-84, F-86, F-100, F-4 Phantom, F-16 and F-15E. Each aircraft is portrayed in its theater of combat: the F-84 and F-86 in Korea, the F-100 and F-4 in Vietnam, the F-16 and F-15 as dressed for their Middle East role. Captions include historical background to embellish this look at the U.S.s most nostalgic gunships. 180 photos, 128 pgs., 8½"x 11½", sfbd. Shows history-making planes such as the WWII Spitfire and P-51 Mustang, the F-16 jet fighter and the Boeing 747 airliner with magnificent, large-scale graphics. See the planes in action, as well as through diagrams showing details of design and construction. Gives young readers exciting glimpses into 20th Century aviation technology and the role it has played in history. Ages 8 and up. 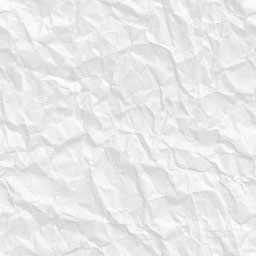 48 pgs., 11"x 14¾", hdbd. Ride shotgun with an elite fighter pilot during operational sorties over the World's war zones. Every stunning air-to-air shot captures the thrill of fighting aircraft in their element. See F-16 Falcons, Tornadoes and Mirage 2000s in action over the Gulf, Bosnia and other war zones. The remarkable photos collected here were taken on actual military missions. 112 pgs., 130 color photos, 9"x 10", sfbd.